My six year old is struggling and has been for a while. We are working on things and she really seems to like her new therapist but as her mom I still worry. There are things that happened to her, things she lived through those first 18 months that affect her more than any of us could have predicted. I will never no everything that happened and I will never understand why bad things (neglect/abuse) happened to her. But they did so we must move forward. But it’s hard so so hard especially now that she is getting older. One of the things we have noticed is she downs herself a lot. If she tries something new and is not successful immediately then she becomes frustrated and starts the “I will never get it” “I can’t do this” “I just give up ” Nothing breaks a mother’s heart more than seeing your child beat themselves up. It’s such a lonely place when you can’t help them no matter what you try. Yesterday did not help matters. It was report card day. I was looking forward to it as well as dreading it. Does that make sense? This was her first report card after our big move. New school, new teacher, new friends and new ways of doing things. Stressed does not even cover what I was feeling. She gets off the bus with a necklace around her neck. She told me she won it for going to school everyday. Perfect attendance for the nine weeks. One would think she would she would be happy, not she was not. She quickly followed up with “Mrs X took me all the way down to orange (not good behavior) today I just quit” I asked why she was moved down (past green, past yellow) ? She replies “She expected me to stay in my seat all day, it’s just not fair” We come in the house and I try to cheer her up but once she has hit that stage it’s almost impossible. She pulls out her report card out of her backpack and slowly hands it to me. There in bold black letters I saw what I already knew. When it comes to her studies (math, reading, writing, ect) she is performing on average or above average for her age. Her classroom behavior was a different story. The teacher had said some things like “Does not listen, does not stay in seat, talks out of turn, does not follow directions” She had only one good mark out of the list of nine. We went over the report card together seeing they use numbers instead of letters like they did back home. I could see in her eyes she was crushed. “I’M TRYING MOMMY I’M JUST NOT GOOD ENOUGH” With that statement my heart broke and I took things into my own hands. The report card does not define who she is. It’s just one thing about her. God does not see her as a child that acts up in school or one that can’t stay in her seat. He knows she’s trying, He knows there are issues. And HE LOVES HER ANYWAY!!! I took the report card, signed it, placed it back in the backpack and went and got some construction paper. And I asked her “Elissa how do you think mommy and daddy see you?” “How do you think God sees you?” She lifted her head and through the tears she replied “You love me always right momma?” And I answered “Yes” We sat at the dinning room table and talked about things she liked about herself and things she thought she could improve on. As we talked we wrote things down. “This will be my chant mommy. 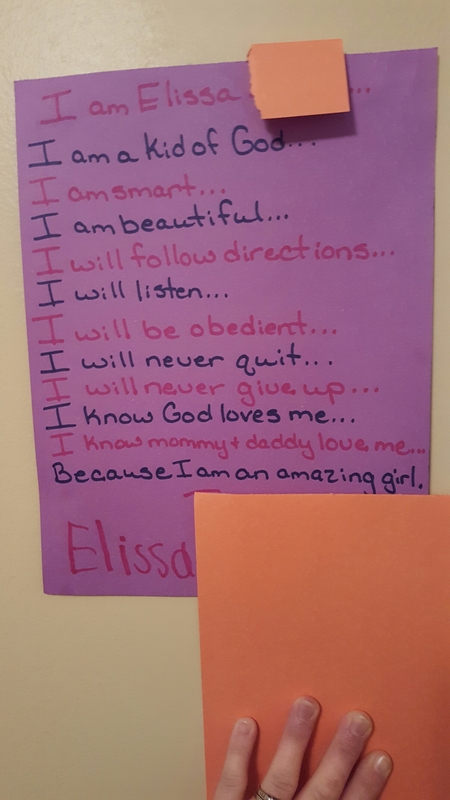 Every morning and every night I am going to say this.” We took it to her room after she picked which statements she wanted on her poster and hung it above her bed. She was smiling from ear to ear. Before she went to bed she stood there and read her “new chant” loud and proud. This morning after she got dressed she looked at me and said “Its chant time momma” and with me by her side she read it loud and proud again. This might not change her over night, but it is giving her a conference I think she needed. Report cards are something many of us take way to serious. Children learn in different ways so they can’t all be graded the same. I know we have a long road ahead of us. And I know that we with make mistakes along the way, and that’s okay. God loves us anyway. Whether we are a straight A (or all 4’s) student or if we are a D(or 1’s) student giving it our best. He loves us anyway. In time we will figure out her behavior issues together. Until then I will love her just as God loves her. From our beautiful chaos to yours don’t let reports determine the love you have for your child. They need to know we love them even on the not so great days. Doctor’s recommend at least eight hours of sleep a night. I don’t know about you but there are some weeks I don’t feel I get eight hours a week much less eight hours a night. Guess that comes with being a mom to five Littles. I am what I would call a seasoned shift sleeper. What is a shift sleeper you may ask? Well it’s exactly what it sounds like, one who sleeps in broken shifts throughout the night. I have been a shift sleeper for so many years I am not sure I could sleep eight straight hours if I tried. For example, last weekend while Sierra and I were visiting friends in Green Bay I thought for sure I would “catch up” on my sleep. I was looking forward to it. Sie and I made it to the hotel, eat, chatted for a while and then I told her I was going to bed. She said I fell asleep quickly, she was still up working on a midterm for college, the problem was I didn’t stay that way. I have gotten up between 2 and 3 in the morning for so long to feed babies I naturally woke up to feed the baby, only problem was she wasn’t with me. I thought about calling my husband or at least sending him a text to make sure he was up, but he assured me he would be fine. ( By the way all the children were fine when I got back home, so I assume my husband did okay filling my shoes for two days.) So I sat there looking at the walls. I got up out of my nice comfy bed, got a drink a water and then tried for what seemed like hours to go back to sleep. Sleep finally came an hour before I had my alarm set. It happens all the time. Normally my nights go something like this: we start putting the kids to bed around 7pm. Bedtime for the kids are at 7(Big Al), 730(Diva), and 830(Wildman). Then we deal with baby girl and our Elmo. Baby girl normally goes to sleep around 8 and then back up at midnight for a bottle. Elmo never sleeps. If I get him to bed by eleven I count it a victory. I am actually typing this with him laying across my lap as he is trying to drift off to dream land. I make my “last rounds” about 11 or 1130, again depending on when our late night error decides to call it a night. By the time I do that it’s time for baby girls bottle. My head finds my pillow and I sleep for a little while. Wildman and Big Al are potty training so the night normally holds at least three “Mommy I got to GO NOW” visits. While I’m up I go around and pull everyone’s blankets back up and make sure their toes are covered. They look so sweet and peaceful while they sleep. I have to cherish this moment so I can recall it and not go “hulk crazy” as the kids call it tomorrow when they are fighting and trying to kill each other over who gets to swing in the yellow swing. They really are precious when they are sleeping. At 3 baby girl is up again for a small bottle, she doesn’t not drink all of it but I think she just likes the one on one time with momma. By 4 one or two of them have managed to make it into our room and by this point I to tried to carry them back for a third time. Then before you know it the 6am alarm goes off and it’s a brand new day. Yeah!!!! And for those that think stay at home moms nap all day let me tell you something…..you’re crazy. I’m not sure when the last time I took a nap was. During the day I am down two Littles with diva and Wildman being in school but that still leaves three here. And they Never nap at the same time ever. So one learns, or adjusts, to running on little sleep. And sorry moms, most dad’s can sleep through a hurricane. So a baby crying or a toddler running up and down the hallway will not phase them. I’m pretty sure they take classes on how to tune out kids. But I would not change a thing. Yes there are days I wish I could lay down and take a nap, or days I wish I could sleep in past 6 a.m.(especially on Saturday and Sundays), or days I didn’t have to get up a 3 for a half eaten bottle. But the truth is I don’t mind any of these things. I enjoy my one on one with my baby girl at 3 am, I enjoy talking and joking with the boys, I am glad they are potty training. Life as a shift sleeper is pretty good. From our beautiful chaos to yours life is to short to sleep through it. There will be time for sleeping when we are died. Enjoy your little ones, hold.them, laugh with them, dance in the rain with them. Author beautifulchaosmommaPosted on October 14, 2016 October 14, 2017 Categories adoption, Being a mom, blessed, Children, Faith, family, foster parent life, Home, Hope, life, love, Mom life, thankfulLeave a comment on Who am I? A letter to our birth mom(s) …. All the little ones are tucked into bed. I have finished the second round of check-ins to cover them back up, change diapers and kiss them once more. Life may be busy and at times overwhelming but I would not change a thing. It’s in the moments like this I find myself thinking of our birth moms. Our adoptions were not the typical ones you see play out on TV or like the ones in the newspaper ads. We did not submit our story to an expecting mother for her to look over our file and pick us to be her child’s forever parents. 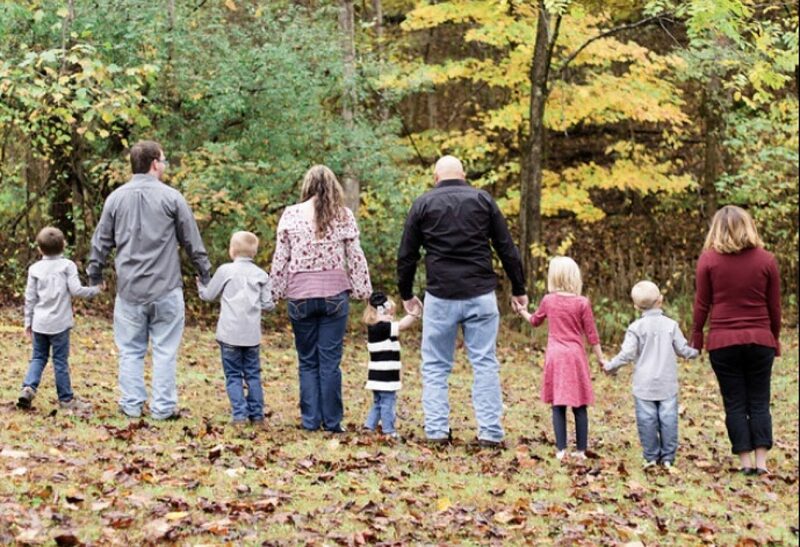 We do not have an open adoption were we(the adoptive parents and birth parents)can share photos and stories about how the kids are and what we both hope their future holds. We do not share stories about our own childhood in hopes to give them the same type of wonderful memories. No our story is nothing like that….so I wonder. I wonder if on their birthdays do you think of them? Do you ask yourself ” I wonder what toys they like now or how tall are they now?” I wonder if you think to yourself “School is starting soon, will she like her new teacher?” ” Will he ride the bus?” I wonder do you miss late night cuddles and having the magicial mommy kiss that can make the biggest boo boos all better? I wonder if you miss hearing the phrases I love you mommy or Can you tuck me in tonight? I wonder if you even realize what you have lost or have the drugs completely consumed you? I wonder and wait for the next call to come in saying ,”she’s had another baby.” I wonder if you miss them. I wonder do you ever cry yourself to sleep? Do you catch yourself looking in the crowd to see if anyone looks like what you picture them to look like. I wonder if friends or family still ask you about them? I wonder what their lives would be like if the state had not stepped in to save them. A million thoughts and questions run through my mind, especially late at night while I rock our youngest back to sleep or while our son is judged by outsiders on his actions, things he can not help because of the drugs and neglect he had to go through. I get so mad at you and the things you’ve done. You have no idea the damage you placed on their lives because of your choices you made without thinking of the outcome for them. But then God reminds me if it was not for you I would not have them with me. So I wonder what do you think of me? I am thankful and grateful that I have been given the chance to be their mom. I am thankful for the few talks we had as we waited outside courtroom doors. I am thankful for a system, though broken sometimes, allowed us to keep 4 siblings together and also allowed us to adopted one who had no one. I could not picture my life without them so I wonder what your life is like without them. I wonder if they have your smile, your laugh, or if they have your personality. Does she get her unruly behaviors from you, does he think and solve problems like you? I wonder if they will ask me questions about you later in life. I wonder how I will answer these questions. I wonder if they will thank me for giving them a chance at a normal life or will they recent me for keeping you away from them? How will I handle that? I wonder if you pray for them and wish them well in their new life. Or if once they were removed from your care you never gave them a second thought? I wonder if your ok. I wonder if you are safe. I wonder if you even care. I know you never planned for drugs and alchol to take over your life. I know that having your children removed and placed in state care was not how you saw things when you were a little girl. I know you must have been angry, scared, and maybe a little ashamed. But I need you to know they are okay. They are better than okay they are great. Know that I love them. All of them. I love them with every beat of my heart. I love early morning wake ups to giggling down the hall. I love story time and playtime and all the times in between. Know that they are happy, sassy, talented, and yes they fight with each other like all siblings do. Know that I vowed to each of them they will always know how special they are each and every day. Know that I am grateful you had them and did not abort them. Thank you for giving them the gift of life. I am blessed to have them here. I am blessed to be their forever mom. I may never know the answers to these questions. And I guess I will be ok with that. I am thankful God placed each of them in my arms. I am thankful He had a plan for them when life throw them a curve ball. I pray for you and your life choices. I pray things start to look up and help is received. I will continue to pray for you I know the circumstances where not what either of us planned but because of you I am mom to my beautiful chaos. We are forever connected in God’s great plan. From our beautiful chaos to yours its okay to question the unknown but dont get stuck there.Someday you may get the answers you are looking for. Until then just have faith in God’s greater plan. Author beautifulchaosmommaPosted on September 9, 2016 September 9, 2017 Categories adoption, Being a mom, blessed, Children, family, foster parent life, love, Mom lifeLeave a comment on Do You Ever Think of Them?